Hello again. I’m trying something new over here. I’ve had a difficult few months – without getting into details, there have been some significant changes in my family life that have thrown my life off it’s axis. I happen to be someone who really loves beginning of the year energy – I love all the resolutions and the hope to improve ourselves and our lives, and I take it pretty seriously. This spot of the internet has been the focus of a lot of my New Years energy, and I’ve been thinking about what is actually important to me, and why I’ve stopped feeling driven to write over here. I think it’s because the recipes I post here started feeling divorced from my real life, which has mostly been filled with cooking large meals for people I love. These meals have generally been fairly simple, relatively focused on being affordable and reasonably healthy, with the occasional 2-day lasagna thrown in for good measure. My best and most important New Years resolution is to cook a community dinner every Thursday. This resolution feeds into my larger resolution, which is to rekindle my old excitement about meeting new people. Is it sad if I tell you that I haven't felt very excited about meeting new people in the last year? It's true. I've been a lil closed off. My dream for this dinner situation is that I will cook a simple meal every week and invite my friends and acquaintances so they can meet each other. My other dream is that I will write about those dinners here because I want this place to reflect my actual life. So: here is my actual life. 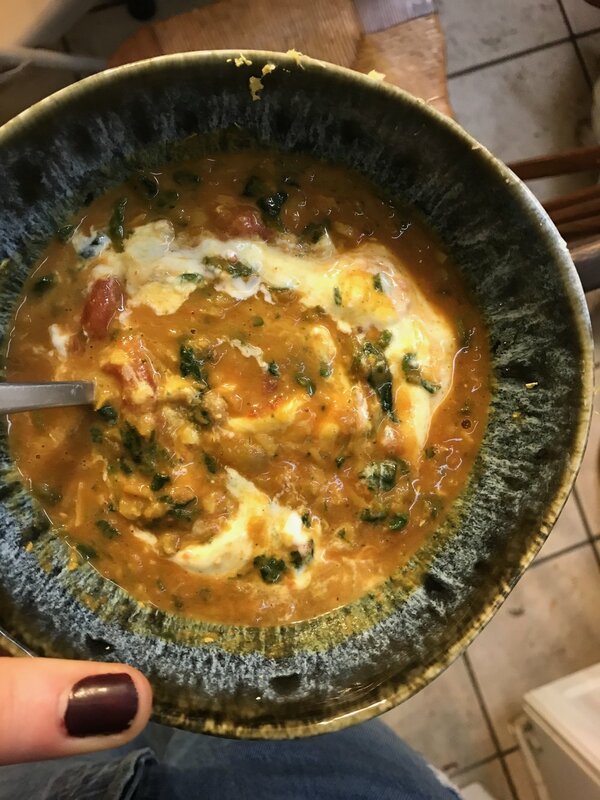 Last week I made vegan coconut lentil soup and it was wonderful and hot and comforting. Thursday was the day after classes started and it was warm (wut) and grey and horrible. I walked back from class and stopped at Med Deli to buy a couple of ingredients that I needed. They happen to have my very favorite bulk bin situation. See below. On day two of my last semester of college I was filled with an almost nauseating anxiety about what I am going to do with my life or at least, like, the first six months after I graduate. The practice of chopping/stirring/seasoning/talking to real humans filled me with immense relief. I think I will be ok.